Update: June 12, 2015: This situation is now being looked into by a member of the recently assembled ICD-11 Project Management team. Although the development process for ICD-11 has been in progress for eight years, it’s still not known how ICD Revision proposes to classify the ICD-10 G93.3 legacy terms. At the end of May, a frozen release was posted for the ICD-11 Beta draft. As you are aware, these three entities (plus a dozen or so synonym terms) were removed without explanation from the Diseases of the nervous system chapter of the public version of the Beta draft, in early 2013. Consequently, for over 2 years, stakeholders throughout the world have been unable to view evolving proposals for the classification of these entities within ICD-11 or to scrutinise proposed chapter location, proposed hierarchies, proposed Definitions and other Content Model parameters. It is very difficult to monitor, make comments or suggestions where terms are not represented within the draft. A request submitted by me, in February, via the Proposal Mechanism, to restore these entities to the public Beta has produced no response. While these three entities remain absent from the Beta draft, stakeholders are effectively disenfranchised from participating in the revision process. 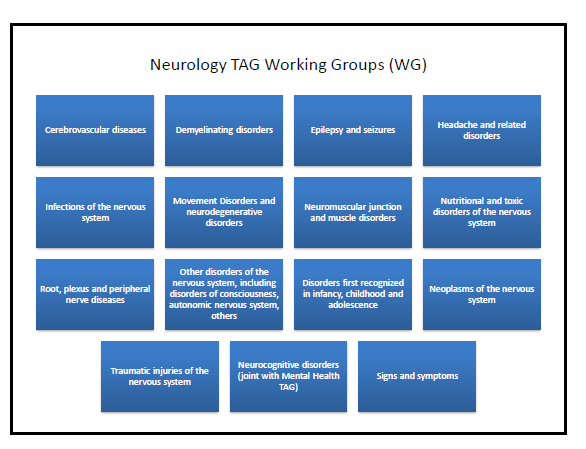 Since the start of the revision process, in 2007, no progress reports, editorials or journal papers have been published on behalf of TAG Neurology discussing the work group’s deliberations for these specific entities. Since early 2013, when the three entities were removed from the public Beta, there has been no information available, at all. I am aware that in March 2014, enquiries had been made by English and Scottish Health Directorates and that WHO was jointly approached by several UK registered ME/CFS patient organizations and English parliamentarians. 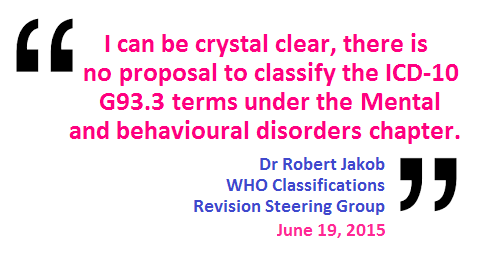 The WHO’s response, at that point, was that proposals for the classification of these terms was unresolved and that more time and more input from the work groups was required . A year later, the need for clarification for current proposals remains unmet. Given the level of concern amongst stakeholders, globally, would you please look into this matter? Could you please expedite the restoring of these terms to the Beta draft, with a Change History, in order that the ICD-11 development process can be inclusive of the thousands of clinicians, researchers, allied health professionals, advocacy organizations and patients with a stakeholder interest in the classification of these terms. If it is not possible to restore terms to the Beta while a freeze is in operation, could TAG Neurology be instructed to issue an immediate statement of intention for these terms, in the interim? Many thanks in anticipation of a swift resolution. 1 Correspondence, Scottish Health Directorate and WHO, March 2014, obtained under FOI. Postviral fatigue syndrome is coded in Chapter VI: Diseases of the nervous system (the Neurology chapter), at code G93.3, under parent class G93 Other disorders of brain (view here). Benign myalgic encephalomyelitis is the inclusion term to Postviral fatigue syndrome and assigned the G93.3 code. Chronic fatigue syndrome is not included in ICD-10 Volume 1: The Tabular List but is indexed to G93.3 in ICD-10: Volume 3: The Alphabetical Index. In May 2010, a change to the hierarchical relationship between the three terms had been proposed. Whereas Postviral fatigue syndrome had been the Title category term for ICD-10, Chronic fatigue syndrome was proposed as the Title category term for ICD-11. As part of a substantive reorganization of the Neurology chapter, the parent class, G93 Other disorders of brain (under which the ICD-10 categories G93.0 thru G93.9 were located), is proposed to be retired for ICD-11. This has meant that the terms that sat under the G93 parent class for ICD-10 would need to be relocated under alternative parent classes for ICD-11 or have new parent classes created for them. In July 2012, the public version of the ICD-11 Beta drafting platform had stood as in my screenshot, below. It’s not evident in my screenshot, but the asterisk at the end of Benign myalgic encephalomyelitis displayed a hover text denoting its specification as the Inclusion term to ICD Title term, Chronic fatigue syndrome. 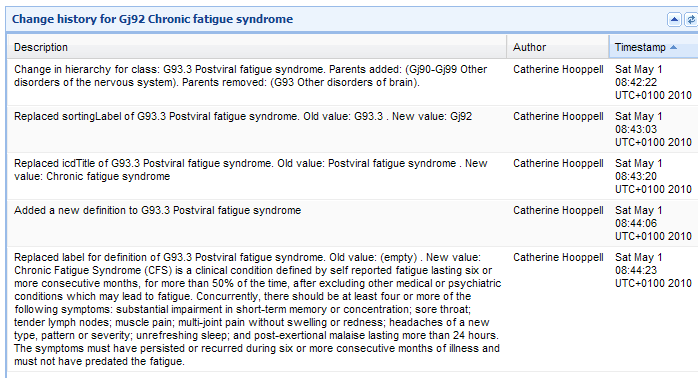 Also not evident in this cropped screenshot is the listing of Postviral fatigue syndrome under Synonyms. The “Selected Cause” sub linearization was later removed from the public Beta draft and some of the terms that had been listed under it were restored to the Neurology chapter and to other chapters. But Title term, Chronic fatigue syndrome, its Inclusion term and its list of Synonyms were not restored to any chapter. 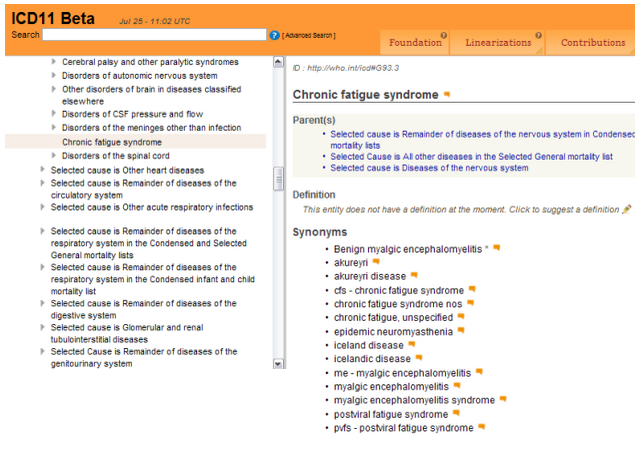 Since February 2013, no listing can be found in any chapter of the public version of the Beta draft, under any linearization, for any of the terms, Postviral fatigue syndrome, Benign myalgic encephalomyelitis or Chronic fatigue syndrome, either as uniquely coded for ICD Title terms, or as Inclusion terms or as Synonyms to Title terms, or listed in the ICD-11 Beta Index. So currently, there is no information within the Beta draft for proposals for these three terms. The public version of the Beta drafting platform displays no editing “Change History” or “Category Notes” for these terms and their continued absence from the draft is hampering professional and public stakeholder scrutiny, discourse and comment. This is not acceptable for any disease category, given that ICD Revision is promoted by WHO’s, Bedirhan Üstün, as an open and transparent process that is inclusive of all classes of stakeholder. The recent external review of the revision process has called for greater transparency . Since June 2013, my repeated requests for an explanation for the absence of these three terms from the Beta draft and for ICD Revision’s intentions for these terms were ignored by ICD Revision until July 2014, when a response was forthcoming from ICD Revision’s, Dr Geoffrey Reed. It is understood that Annette Brooke MP also received a response, in July 2014, from WHO’s, Dr Robert Jakob, in respect of the joint organizations’ letter of March 18, for which Ms Brooke had been a co-signatory . WHO and ICD Revision’s, Dr Geoffrey Reed (Senior Project Officer, Revision of Mental and behavioural disorders), have said that there has been no proposal and no intention to include ME or other conditions such as fibromyalgia or chronic fatigue syndrome in the classification of mental disorders. Dr Reed has said that the easiest way to make this absolutely clear will be through the use of exclusion terms. However, he has said that he would be unable to request that exclusion terms are added to relevant Mental and behavioural disorders categories (e.g. Bodily distress disorder) until the conditions that are being excluded exist in the classification; that at such time, he would be happy to do so. In August 2014, I submitted two FOI requests, one to the Scottish Health Directorate, one to the English Department of Health. The latter was not deemed specific enough in terms of named health agencies for a response to be generated, but I did receive information regarding the former. **Rescheduled in May, this year; the proposed target for presentation for WHA approval is currently May 2018. This is all that has been disclosed by WHO/ICD Revision in respect of current proposals for the classification of the three ICD-10 G93.3 terms, despite the fact that ICD-11 has now been under development for 8 years, and prior to the timeline extension in January 2014, the new edition had been scheduled for WHA approval and dissemination in 2015. • what hierarchies are proposed, in terms of coded for Title terms, Inclusions, Synonyms?